Chad and Cherie Ball are owners of Wheel Estate. Chad and Cherie Ball, owners of Wheel Estate. Calgary’s Business: What is Wheel Estate and how did the company come into being? 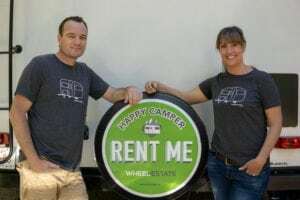 Chad and Cherie: Wheel Estate is a peer-to-peer RV trailer sharing marketplace. We efficiently connect people who would like to rent a travel trailer with owners whose trailer would otherwise go unused, backing each reservation with our $1-million insurance policy. Our story begins in 2008 and like many Canadians our family was hit hard with the recession that year, and by 2010 we found ourselves struggling to make ends meet. When it came time to take a much-needed family vacation, there were few options we could afford, so we thought: why not go camping? That’s cheap, right? We have a love-hate relationship with tenting, so we thought let’s see how much renting an RV would cost. As we quickly learned, renting from a traditional RV rental dealership would cost us roughly the same amount as a beach vacation, which is when we turned our attention to our neighbour’s driveway, where their travel trailer had been sitting all year unused. While our neighbour was happy to rent us their unit for the weekend, their insurance company was less than thrilled, which is when we learned there was no formal insurance policy in place for this type of arrangement. In fact, they told him if money exchanged hands, his policy on his trailer would be null and void if something happened while we had it. In the end, we borrowed a friend’s trailer for that August long weekend in 2010 and made our way to the mountains. Along the way, we began to notice storage yard after storage yard filled with RVs. That was the day the light bulb went off and we thought: wouldn’t it be great if there was a website for RV owners to earn some money by renting out their units when they are not using them, to people like us looking for an affordable way to go camping? At that moment, the idea for Wheel Estate was born. After a little more research, we also learned that in Canada there are approximately 2.1 million personally-owned RVs and nine out 10 are used on average just 14 days out of the year. Canadians also spend $1.9 billion per year on insurance, maintenance and storage costs, all for RVs they aren’t even using. To us this seemed like such a waste, and that these units could be utilized in a much better way. Little did we know that after our weekend getaway in 2010 that we would be on a seven-year journey before Wheel Estate would be able to launch. CB: What were the biggest challenges you faced in setting up the business? Chad: My background was from the new home construction industry, and Cherie was oil and gas industry. So when we wondered why there wasn’t a simple website to connect the RV owner to a renter, we obviously had no idea what we were in for. The first thing we knew was we didn’t have a company if we couldn’t find an insurer to write a one-of-a-kind policy for a peer-to-peer transaction, which to our surprise hadn’t been done before. f you remember in 2010, Airbnb was in its infancy and no one really knew what the sharing economy was (including us) back then, so we were really breaking new ground. It took two years of getting rejected by every insurance company we pitched our idea to. Then after two years we caught a break when we met a broker who saw the value in what we were doing. He went and pitched it to some of his contacts, who agreed to put a policy together for Wheel Estate. Little did we know that it would take four years to button up all the details since this unique type of insurance policy had never been written before. CB: What has been the response to your business since you established it? Chad and Cherie: After years of hard work and perseverance, on Jan. 1, 2017, we went live. Since our launch, guests booked over 7,500 nights through Wheel Estate, equalling over 180,000 hours out on the road. We’re jealous of all the amazing adventures that have taken place through WE, but proud that we had a part to play in creating those experiences. Before WE launched, we said how we would be happy if one person used the site, so we can’t believe what WE has achieved. We’ve seen young families who don’t own an RV exploring the beautiful sights of Canada, and international travellers visiting Canada having an opportunity to do the same. We’ve seen weddings, honeymoons, quick weekends away, extended camping trips and even family reunions. Building a community of like-minded people who share our values is always top of mind. As we’ve grown, we’ve noticed how guests are returning, often to stay with the same owners or they refer a friend or family member who’s had a great trip. We’ve also seen a growth in ‘rentrepreneurs,’ with people listing multiple units and starting their own micro business. 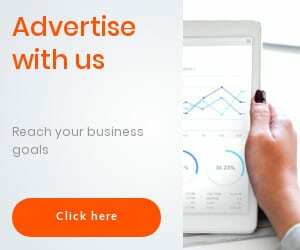 Since WE launched, we’ve seen a 2,800-plus per cent increase of ‘rentrepreneurs.’ Those advertising their units on Wheel Estate have so far made over $750,000. Our mission is to create meaningful experiences every trip for all members. CB: What are the future plans for the company? Chad and Cherie: Thousands of happy campers later, we’re always looking to the future for Wheel Estate. It made sense to start in Alberta, in our own backyard. However, we have listings coast to coast throughout Canada. The next logical step would be expansion into the U.S. since we share a common border, although Wheel Estate’s insurance policy permits cross border trips. CB: What’s your best piece of advice for someone who wants to become an entrepreneur? Chad and Cherie: It is actually simple: follow your gut, every time, it will never steer you wrong. If you ever question that gut feeling, remember to stay true to your core values as a human and a business – never waver or do something you don’t believe in. There will always be haters or people who tell you your idea won’t work. Don’t let them in your head. Instead, use the comments to fuel your passion and prove them wrong. If we would have listened to them, Wheel Estate would not have survived the seven-plus year journey just to launch.